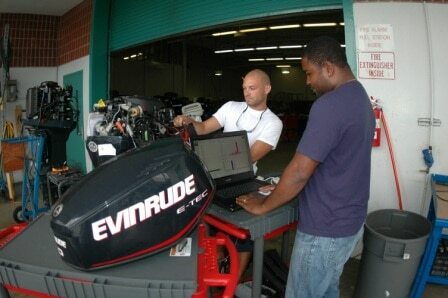 The Marine Service Technologies course will prepare students for a career in the pleasure boating industry by providing students with the skills necessary to diagnose, overhaul and repair crafts of 50 feet and under and their outboard engines. The student will cover such topics as Marine Rigging, Outboard Engines, Fuel Injection Principles, Stern Drives and basic knowledge of Electronics Installation and Inboard Engines. Students must exhibit the strong reading, math, and computer skills necessary to be successful in the program, and must possess a solid mechanical aptitude.